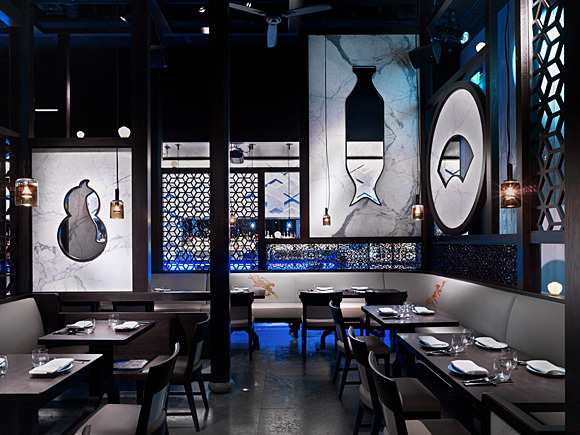 Hakkasan Las Vegas main dining room. Our Hakkasan images crosses over from editorial to advertising. The photos of the new Las Vegas Mega Nightclub and Restaurant were originally shot for editorial, but our client decided to use them for advertising, as well. We’d like to give credit where credit is due. As happy we are with the final results it did not hurt that the Paris-based design firm “Gilles & Boissier” created a unique interior architecture. Producing images that read clearly in any media is one thing, however, the extreme darkness and limited color palette made it a bit more challenging. See more images after the break.